Gerry Sant is an agent with the French Secret Service. That is his employer during the recorded adventures available to us. He puts it as such during the early passages of his sage: "I am a cosmopolitan, the subject of no country, though through my parents my sympathies are more English than anything else. British when in England, I am a Frenchman in France, an Italian in Italy; I can be a German in Germany, or a Spaniard in Spain. The explanation is, of course, that I have led a wandering life, being of almost every nationality by turn and nothing for long." Sant goes on to explain that he was born of (probably British) parents who were living in what was then known as Smyrna and is now know as Izmir, a city of Greek origin on the western shores of modern day Turkey. He brags, understandably so, that "whoever is born in Smyrna, as I was, has truly a ready-made profession in the matter of languages. At ten years old most lads in Smyrna can speak four or five tongues, and, in addition, I developed early a peculiar gift for languages, and an insatiable desire to speak as many as possible. Thus, all the principal European languages became equally familiar to me, and I speak them all almost as well as if each were my mother tongue." 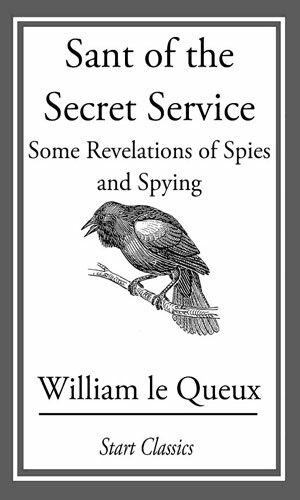 In the introduction to the Sant tales, the author, a friend of Sant entrusted to unveil the stories, states that "to those who, like myself, have moved in the Continental underworld of spies and spying, the name of “Sant of the Secret Service” is synonymous with all that is ingenious, resourceful, and daring. In the Intelligence Departments of London, Paris, Rome, and New York, the name of “Sant of the Secret Service” is to-day one to conjure with." He further describes "cheerful, optimistic, and the most modest of men, Gerry Sant has seldom spoken of his own adventures. The son of a certain nobleman who must here remain nameless, and hence the scion of a noble house, he has graduated through all stages of the dark and devious ways of espionage." From all this we can safely deduce that Sant is a spy for hire, if the nation doing the hiring is not at the time an enemy of Britain. At the time of the stories, both Britain and France were deeply engaged in the fighting of World War I and Sant, eager to be of help in the best way he can, offered his impressive talents to the French as they were closer to the enemy than England. He most frequently works, though, for the French for it was with them that he made his first foray into the cloak and dagger world and his affection remains. Sant has no modesty when it comes to his abilities. While his friend early indicated that Sant was not one to speak of his triumphs, he nevertheless would not ever deny he was extremely good at espionage and highly successful as well. This is thanks in large part to a talent, described as "every 'natural' spy, if I may use the term - and I think I am one of them - possesses a large measure of that intuition which is somewhat akin to a woman’s power of frequently jumping to a perfectly correct conclusion without the trouble of logically working a problem out." In the cases we have of Sant, he works for Armand Hecq, the astute chief of the French International Secret Service Bureau. He makes frequent use of the lovely Gabrielle Soyez who "was a female agent of the British Secret Service, who had distinguished herself in her profession times out of number, both before and since the outbreak of war. Dark-haired and handsome, she inherited from her French father that seemingly irresponsible and irrepressible gaiety which so many of her countrywomen exhibit. From her English mother, no doubt, she had acquired the sterner, almost masculine, qualities which her femininity concealed but did not suppress. A splendid linguist, speaking several European tongues to perfection, she could, on occasion, pass as a native of some other countries." The collection of five adventures into one volume is by no means unique as authors had done that for years. What is rather interesting, to me, is that each of the tales was broken into chapters (again, not so rare) but then the chapters were all treated equally. There was no clear demarcation between stories in the titling. There was no distinct separation of the five stories and yet when you read the end of each, it clearly ends and the next mission starts cleanly. I have looked and did not find any reference to these tales having been published in any format other than book prior to this release. There could have been, of course. 1 "The Secret Submarine Base"
The 3rd adventure in the collection Sant of the Secret Service. It amazes Gerry Sant, and yet does not, how a blind beggar on the street is both seen and ignored. Such a ubiquitous individual can go anywhere and be unnoticed and in so doing gather a lot of information which is the case of Blind Heinrich. 4 "The Great Submarine Plot"
The 4th adventure in the collection Sant of the Secret Service. Oscar Engström is a Swedish engineer whose activities have intrigued Gerry Sant for some weeks and now in Switzerland, he hopes to learn what the man is really up to and how might it help the German war effort. The 5th adventure in the collection Sant of the Secret Service. An explosion in a public garden in London has the authorities in deep concern because found there were several small cylinders filled with the explosive thought to have caused such destruction in the bombing. The explosive material was new and obviously powerful. Who made it? What was it made of? What was the overall objective? Gerry Sant's planned vacation with his fiancée is put on hold. The author, William Le Queux, was the writer of an impressive number of adventures during his career. Most are one-shot epistles but a small handful dealt with a series character. Of those few, two have gained a modicum of prominence: Duckworth Drew (who deserves it just for the name) and Gerry Sant. Drew got a television episode about him; Sant did not. Yet Sant seems to have had more editions published. I cannot say why. And the way the 5 adventures were presented, they seemed to be tailor-made for television or radio mini-dramas, written a decade ahead of the popularity of radio and four decades before television hit it big. I am surprised no one tried movie serials since there are a decent amount of action in the tales. Sant is rather full of himself or at least of the 'nobility' of his craft. Nations rise and fall, he claims proudly, on the information gathered in secret by agents of the various Secret Services. And yet the actual operatives are forever on their own, unable to call for help when captured or treed. Mind you, he never 'boo-hoos' this situation but rather preens over how intrepid good agents need to be, himself especially so. Me, I wonder how Sant's much put upon fiancée puts up with the constant disappointment. More than one vacation is cancelled because of duty and she sits at home for weeks on end waiting for a visit. Of course, considering how 'noble' Sant feels about himself and his profession, she might enjoy the solitude. The Sant stories are, IMHO, vitally important for the historical aspect of the evolution of the spy series. There was no more prolific spy author at the time than Le Queux and Sant represents the writer nearing the end of his trade and the last spy series character (that I know of at this time) that he created.